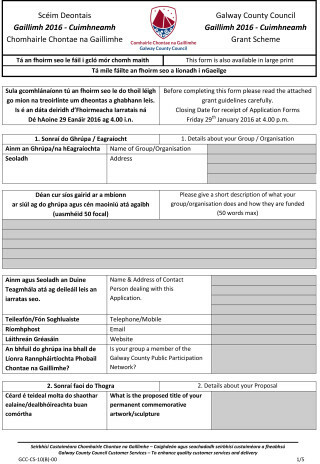 Galway County Council invites participation from local groups and organisations to be part of ‘Gaillimh 2016’ as the County of Galway collectively commemorates the special role played by the County of Galway in the 1916 Rising. Galway County Council invites community groups and organizations to avail of ‘Gaillimh 2016 – Cuimhneamh’ to apply for grant funding to provide an artwork/sculpture of high artistic quality that enables new ways of Remembering, Reconciling, Presenting, Imagining and Celebrating the Centenary of the 1916 Rising in the County of Galway. ‘Gaillimh 2016 – Cuimhneamh’ affords the communities of each of the 5 Municipal Districts the opportunity to engage with the central role played by the people of the County of Galway, and in particular their own Municipal District, in the 1916 Easter Rising, while contributing a contemporary permanent reminder of their 2016 commemorations in the form of an artwork/sculpture, thereby inter-connecting history, art and community. 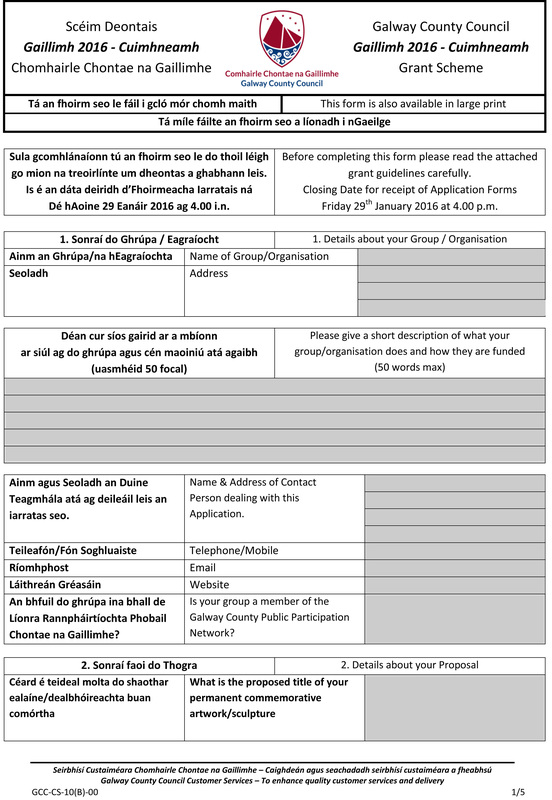 The Closing Date for Completed Application Forms is 4.00pm on Friday 29th January 2016.